“Zen Turtle” started with a photograph of a turtle I took balancing perfectly on a bump on a log. He looked so serene, I had to draw him. This piece measures 11×17″ and is available for purchase. Prints can be found on my Etsy page. Toad Stack is a colored pencil drawing on Stonehenge paper using Caran D’ache Luminance and Pablo pencils. There are prints and the original available. These Christmas Toads are from 2015 and 2014. Prints and greeting cards available! 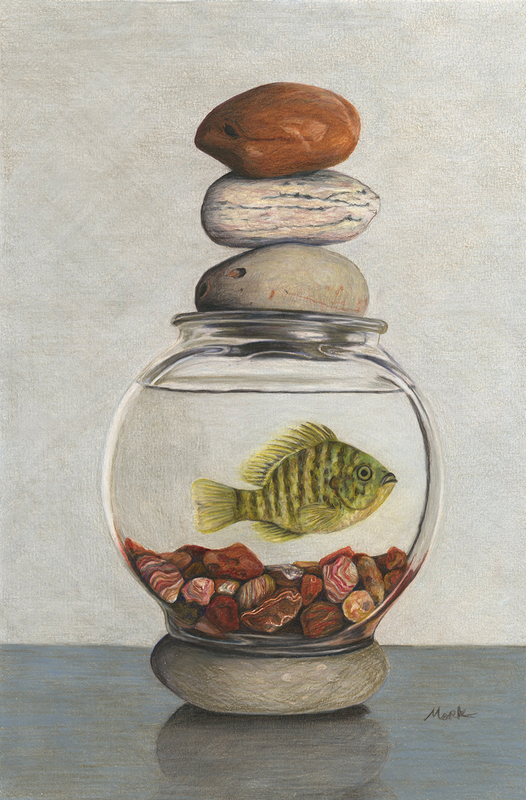 “Cairn I” is 11×16″ colored pencil on paper. The framed original is available for $800. “High Rise” is Colored Pencil on paper mounted to birch panel. It measures 10×20″. The original is available for $600. Please contact me for details. This “Parts” series is a series of 10×10″ drawings mounted on 1 1/2″ tall cradled boards. The drawings are based on close crops of my personal photography. I love how they can be mixed and matched in groups. I am asking $175 each drawing with discounts on four or more. Contact me for details. I took my daughter fishing for this piece. We caught the sunny at the fishing dock on Lake Nokomis in Minneapolis. We had pretty good luck fishing there over all. The sunnies are savvy but you can trick them with some strategic wiggling. The original work is Sold. Prints are available.